Coming from Norway, having lived in the USA and living in Sweden, my traditions have become a mix of many cultures. And as I keep my Norwegian and even Swedish one´s I also like to mix it with a little American. And this weekend was Thanksgiving in the USA. Thursday was actually the right day, but friday night I made thanksgiving dinner for me and my daughter Frida with a whole turkey. Recipts for making a whole turkey in the oven are so many. There are so many ways to fill it and also various spices to use, all according to taste really. So to give a recipt is kind of hard. There are also a variety of things that you usually serve with the turkey from bryssel sprouts to red cabbage. Also what kind of potatoes, mashed or baked in various ways. Since we were only two and my daughter don´t even taste the filling I made a small turkey with simply boiled potatoes and green beans. A good creamy sauce and a filling with fruits mainly mixed with the liver and spices. For your own turkey search recipts that you like. A turkey is too much for two people, but I don´t mind the left overs. It is nice to have another meal ready to just heat in the micro the day after. And I also use to take the meat off the bones, cut it in smaller pieces and put it in portions in the freezer to be used for pastasallad when me and my daughter go to soccertournaments. 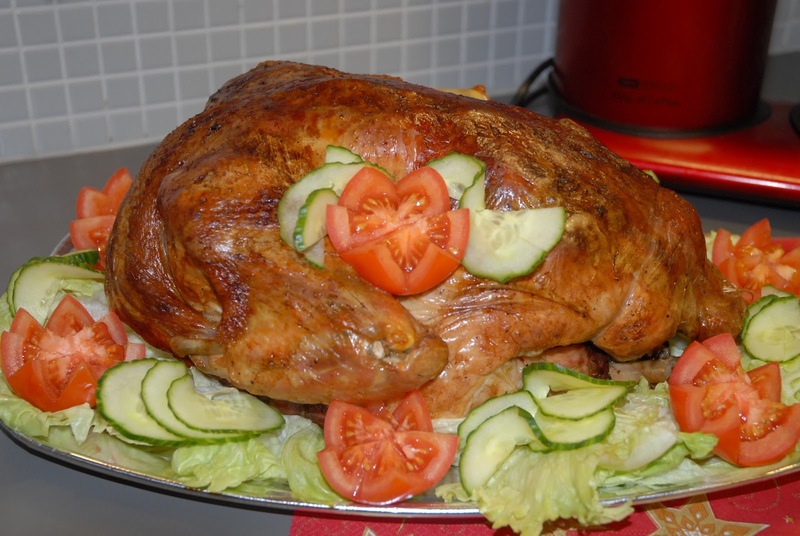 Now we have turkeymeat ready for this for the indoor season between christmas and new year and even after new year. If you have never roasted a turkey before, or if your turkeys always turn out dry, here is a handy guide to preparing the perfect Thanksgiving bird. Preheat the oven to 350 Fahrenheit degrees. Remove the turkey from its packaging, but save the wrapping for its information on suggested cooking times. Remove and discard the metal or plastic braces that are holding the legs in place. Remove the giblets and neck. If you plan to cook these with the bird or use them in your stuffing, set them aside. You can also freeze them (if your turkey was fresh) to use later for turkey stock. Or you can cook them (wrapped inside tin foil) and feed them to your pets. Wash the turkey thoroughly, inside and out, with cold running tap water. Water from the cavity of the bird should eventually run clear, i.e. no blood. Trim away any excess skin and fat from the neck and bottom of the turkey. Place the turkey, breast side up, in a non-shallow roasting pan. If you are planning to stuff the bird, you might want to first line the roasting pan with celery and onions or an herbal bundle (thyme, rosemary and sage all complement the natural flavor of turkey). Then stuff the bird with your homemade stuffing. If you are not planning to stuff the bird, fill the cavity with one or more of the following to enhance the flavor of the meat: celery and onions; an herb bouquet; chopped apples; or even a whole orange or lemon (punctured with fork tines to release more flavor). Pour a stick of melted butter or margarine over the turkey. Season the turkey by rubbing herbs or seasoning in to the skin of the bird. Chose from any combination of freshly ground sea salt, freshly ground black pepper, dried onions or onion powder, minced garlic, sage, savory, lemon pepper, lemon juice or basil. Let your taste buds and your imagination guide you. Pour 2 cups of water into the bottom of the roasting pan and insert a meat thermometer deep into the thigh area. Place the pan into the preheated oven. Open the oven door first, as the pan will be extremely heavy, particularly if your bird is stuffed. Set a timer for the length of time recommended on the packaging, which will be between three and six hours, depending on the size of the turkey (and your individual oven). Be sure to check on the bird every hour and baste it each time. When done, the outside skin will be brown and lightly crispy, the meat thermometer will register at least 180 Fahrenheit degrees, and both legs and wings will move easily. A well-cooked bird will have tender, moist meat; an overcooked one will have dry (and potentially flavorless) meat. Remove the turkey from oven and let it sit on your counter for about 20-30 minutes before carving. Cover with a roasting pan lid, especially if you have animals at home. The night before you want to eat the stuffing, break the bread into small pieces (about 1 inch squares) into 2 huge bowls or pots. Let the bread sit overnight to dry out. The next day, after you remove the insides of turkey, boil them in water in 2/3 qt. sauce pan until cooked (about 20/30 minutes). Remove insides for later use or discard. Keep water and put aside. Chop onion and celery and place into food processor until minced. Melt 2-3 tablespoons of butter in large saucepan. Saute onion and celery until heated through. Do not brown! (Saute mushrooms also at this time if wanted). Depending on how much stuffing you want and how much celery and onion you\'ve chopped, you may have to saute the onion and celery in two parts. Once cooked, pour the onion/celery mixture directly over the dried out bread. Pour 1/2 tsp. sage over bread/onion/celery mixture. Then take your reserved water and pour slowly over bread. The bread will shrink as you do this. Be careful not to pour too much water in. Mixture thoroughly and smell/taste for perfect stuffing. If you need more liquid, open a can of chicken broth and pour over bread. If you need more spice, add more sage. If you are using oysters, add them now. Once stuffing is of a consistency that it will stick together and does not look too dry, do not add more liquid. Either stuff in turkey to be baked in oven, or put in 9 x 13 pan. If using oysters, it is recommended that you bake the stuffing in a pan so as to ensure the oysters will be cooked through. Bake in 350 F degree oven for 45 minutes to an hour. You want the stuffing to have a nice brown crust on top. Cook and stir, until gravy boils and is slighty thick. 2. Tag bort halsen och rensa och skölj kalkonen. Klappa kalkonen torr med hushållspapper. Placera kalkonen med bröstsidan upp på gallret med en djup långpanna under. 3. Fyll ev. kalkonen med fyllningen (se separat recept). Gnid in skinnet med det mjuka smöret och krydda med salt och peppar. Placera ett stort ark med aluminiumfolie som ett "tält" över kalkonen. 4. Sätt in kalkonen i ugnen och häll 5 dl av kalkonbuljongen i den djupa långpannan. Ös kalkonen med buljongen som rinner ner i pannan med ca 30 minuters mellanrum. När buljongen i pannan har dunstat upp så tillsätter man ca 2 –3 dl buljong. 5. Tag bort aluminiumfolie efter ca 2,5 timme. Tillaga kalkonen i ugnen tills att termometern visar 80 grader i kalkonens lårdel. Det tar ca 3,5 - 4 timmar. 6. Flytta över kalkonen till ett serveringsfat och låt den vila minst 20-30 minuter innan den kan skäras upp.